Includes back roads, elevation contours, recreational areas, etc. Delorme, a travel planning resource. More than just a great place to purchase DeLorme mapping software, the earth mate GPS and Atlas & gazetteers for every state. You'll find a rich assortment of travel planning items, guide books, globes, maps and atlases covering the entire world. Plus geography-related gift items for travelers, perfect for graduation, retirement, father's day, and holiday gifts. 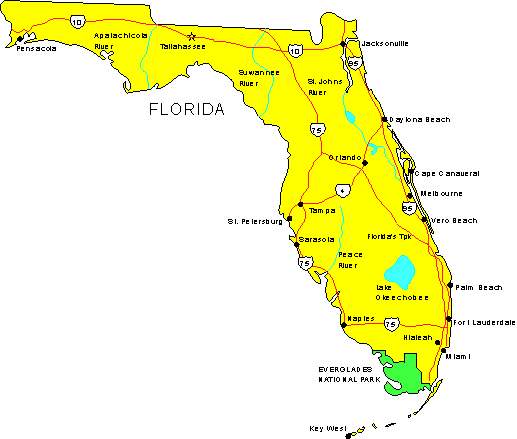 The durable and convenient Florida EasyToFold state map will take all the wear and tear your journey can dish out. The heavy-duty laminated design allows you to mark your route, make notes, then wipe the surface clean for further use. This is a must-have for navigation whether you're a state resident or just passing through. VanDam's StreetSmart Florida maps all of Florida's top attractions, theme parks, museums, hotels, resorts and beaches with highways exits clearly marked at an immensely legible scale of 1:1,470,000. This driving map puts all of Florida in context plus provides local details for all major cities. The map is so legible you can read it from 3 feet away. This clarity of information design has earned VanDam maps a place in the MoMA Design Collection. 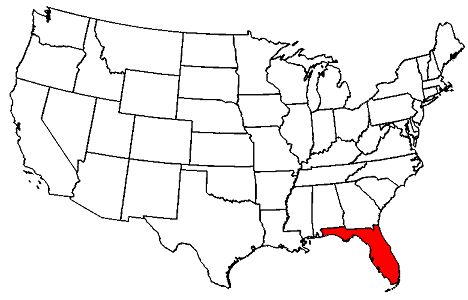 CONTENTS: Florida State map 1:1,470,000; Map details of Jacksonville 1:600,000; Gainesville 1:135,000; Pensacola 1:280,000; Tallahassee 1:200,000; Panama City 1:180,000; Daytona Beach 1:240,000; Orlando 1:325,000; Tampa-St Petersburg 1:680,000; Gold Coast from Miami to Palm Beach 1:750,000; Fort Meyers to Cape Coral 1:470,000; and Key West 1:52,000. StreetSmart Florida is laminated for durability and measures 4" x 9" closed (32" x 9" open) to snuggly fit into your pocket. If you are looking for the Art Deco District in Miami Beach, Books and Books in Key West, the right exit to the Magic Kingdom in Orlando, the shortest route to the Space & Missile Museum in Cape Canaveral, the Shark Valley Visitor Center in the Everglades or want to visit the Florida State Capitol in Tallahassee. StreetSmart Florida helps you to travel with confidence. You will understand the overall highway system and each individual exit to get you there quickly and in style. 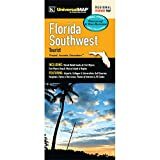 Rand McNally's Easy To Read State Folded Map is a must-have for anyone traveling in and around Florida, offering unbeatable accuracy and reliability at a great price. Our trusted cartography shows all Interstate, U.S., state, and county highways, along with clearly indicated parks, points of interest, airports, county boundaries, and streets. Whether traveling for business or leisure, let National Geographic's Florida Guide Map lead you on your visit to the "Sunshine State." 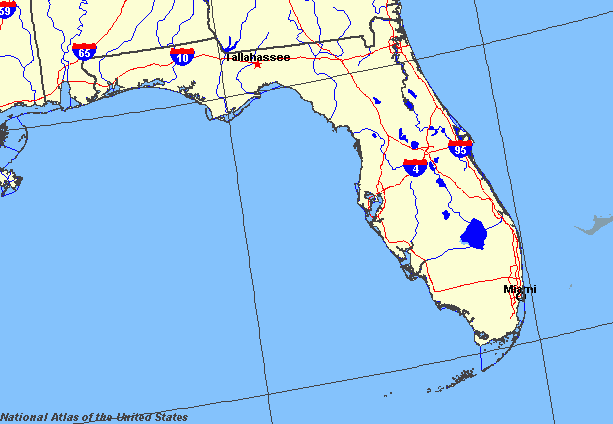 Coverage is unparalleled with one large road map encompassing the entire state and several detailed city and metropolitan area inset maps, including Jacksonville, Miami, Tampa-St. Petersburg, Orlando, Tallahassee, Fort Myers-Cape Coral, Gainesville, Melbourne-Kennedy Space Center, Dayton Beach, Pensacola, Panama City and Key West. Pinpointed are hundreds points of interest, national and state recreation lands, campgrounds, visitor centers, airports and hospitals. Visitor information is given for Miami/Miami Beach, Orlando and Key West along as well as Everglades National Park and the Florida Panhandle scenic drive. Descriptions of many popular points of interest, a calendar of events, a chart of services at national parks and a convenient index of counties, cities and towns will help you plan your itinerary. 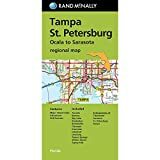 Sheet Size = 17.75" x 24.75"
Folded Size = 4" x 8.75"
Rand McNally's folded map for Tampa St.Petersburg is a must-have for anyone traveling in and around this part of Florida, offering unbeatable accuracy and reliability at a great price. Our trusted cartography shows all Interstate, U.S., state, and county highways, along with clearly indicated parks, points of interest, airports, county boundaries, and streets. The easy-to-use legend and detailed index make for quick and easy location of destinations. You'll see why Rand McNally folded maps have been the trusted standard for years.